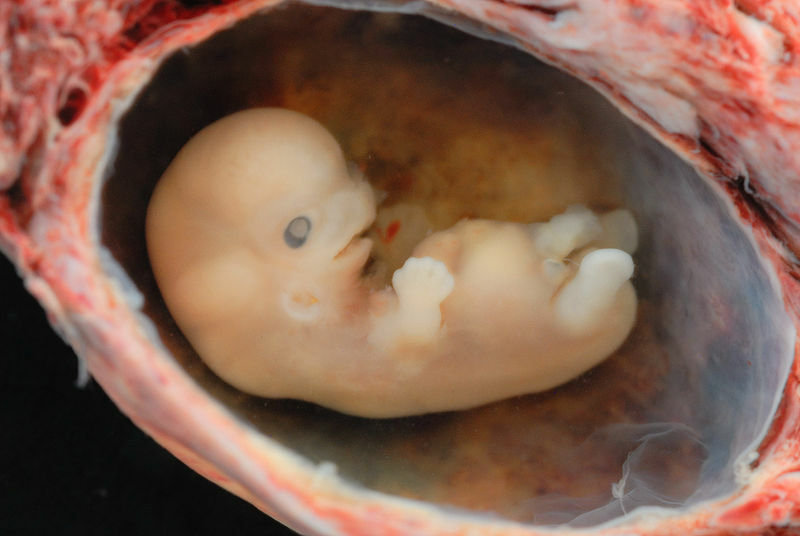 A human embryo at six-weeks gestation. I will pass over the “clump of cells” expression. Such terms are unbecoming in anyone who desires to use words to express the full truth about anything. But to say that pro-lifers “romanticize” the unborn is to unwittingly indicate the deep debt we owe to Romanticism for our knowledge and appreciation of unborn life. Romanticism was a cultural movement of the nineteenth century that is most often associated with an emphasis on feeling as a way to understand the world. But as interpreted by some nineteenth-century philosophers and biologists, Romanticism also emphasized development as key. The Enlightenment which preceded Romanticism had been all about analyzing a thing according to the interaction of its component parts–an emphasis known as mechanism. Romanticism, on the other hand, encouraged viewing a thing according to its history and its change over time. Indeed, a natural thing was a changing thing, and its nature was progressively revealed, though always present, over time. To a “romantic” biologist, therefore, a living organism was not only what it manifested itself to be at a given movement, but also what it had been and, most especially, what it would become. At any given movement, its potentiality was as much a part of its makeup as its actuality. Though his primary meaning certainly lay elsewhere, the great Romantic poet Wordsworth expressed this beautifully in his famous line, “The child is father of the man.” Each stage of human life is partly defined by the stages that will follow. Influenced by Romanticism, nineteenth-century scientists made huge gains in our understanding of embryology. Led by the German Karl Von Baer, who discovered the mammalian egg in 1828, they produced information-rich studies that underpin scientific understanding to this day. They were less interested in the causes of embryological development than in the specific details of the development itself. They helped bring about a great leap forward not only in our understanding of the stages of gestation but also in our capacity to contextualize those stages as part of a single, meaningful biological narrative, from conception to the birth of a living child. These discoveries enriched both our scientific understanding of the unborn and our affective response to them. We can call this “sentimental” if we must, but in that case we must also admit that recognizing development, context, and potentiality is always and everywhere taken to be a sign of intelligence, creativity, vision, and humaneness. What would we think of a coach who saw no more potential in his players than what they could show on the first day of practice? Or the teacher who thought her students could learn no more than what they knew on the first day of class? What sort of players and students would develop under such shortsighted leadership? The potter cannot create a beautiful bowl if he only sees shapeless clay on the wheel. We should not fall into a similar ignorance about the unborn. An unsentimental view of the unborn that detaches each gestational age from the stages that follow is both anti-scientific and anti-romantic. It will always obscure more truth than it reveals. And far from encouraging sympathy for the mother, as its advocates seem to hope, it will train minds and hearts away from appreciating the power of development in the lives of all human beings, born and unborn. Thanks, Tony, for making analogy between “clump of cells” and a player’s first day of practice/student’s first day of school. This article presents a clear argument. St. Thomas Aquinas, from what I have heard, was very good at doing this. Wow…that was great! I really enjoyed how you took the historical developments of the Romantic Period and show practically how they still affect our lives today. As a history lover, I really enjoy writing of this nature, and look forward to hearing more from you in the future. Tony, I teach Romanticism every single semester, and I never thought about it this way before. Excellent essay–so well said. We need more explanations like this one–and I especially like your point about the anti-scientific aspect of an unsentimental view of the unborn…..The law constantly invokes science, yet you point out the anti-scientific stance that the law obviously takes under the status quo. Thanks so much for writing this.